I recently switched to an early-morning schedule, just for fun. 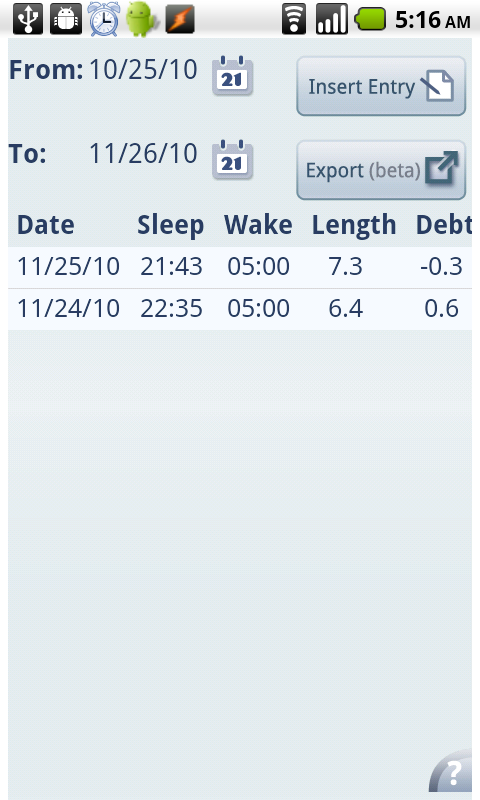 Tracking my sleep helps me motivate myself to go to bed when I promised to and wake up when my alarm goes off, and it comes with useful bonuses too. 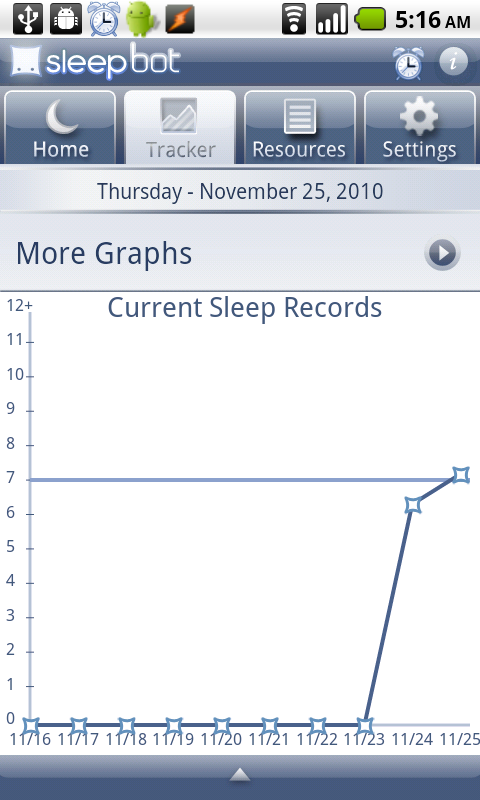 I had been using the Sleep On It application on my iPod Touch to track my sleep and set my alarm. 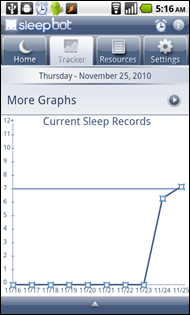 When I switched to an Android phone, one of the first applications I installed was for sleep tracking as well. 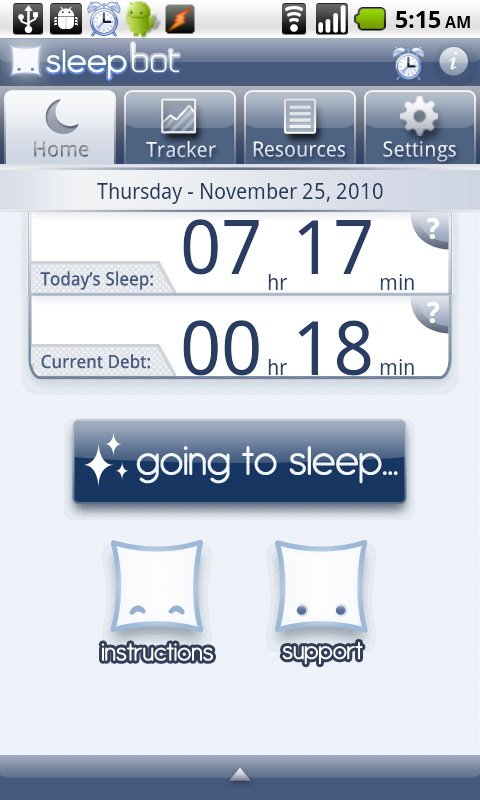 Sleep Bot Tracker Log is a fantastic sleep tracker – and it’s free. 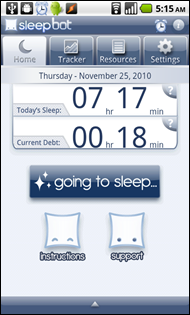 The basics: you “clock in” by clicking on the going to sleep button, which changes to a waking up button. 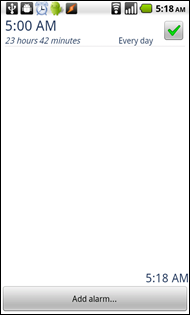 When you wake up, you can hit the snooze button (if you’ve configured snooze) or slide your finger across the screen in order to clear the alarm. 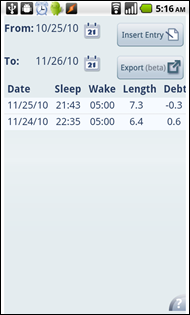 Using Sleep Bot to track your sleep means that you can view your sleep data as a graph, graph, table, or comma-separated export file – good for keeping yourself accountable. 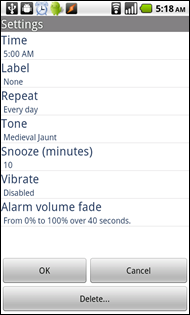 You can set an alarm by clicking on the small alarm clock icon in the upper right. I particularly like the ability to see how much time is left before the alarm goes off, which helps me figure out how much time I have before I should go to bed. 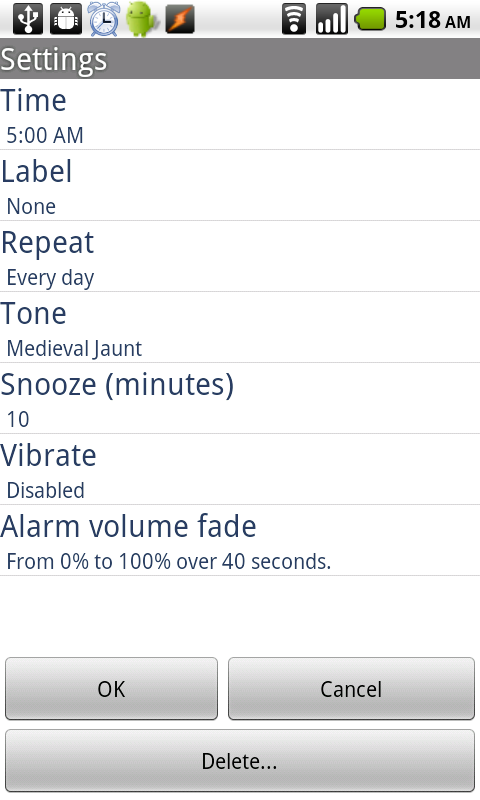 You can set the alarm tone to ringtones or songs, and configure it to fade in gradually. 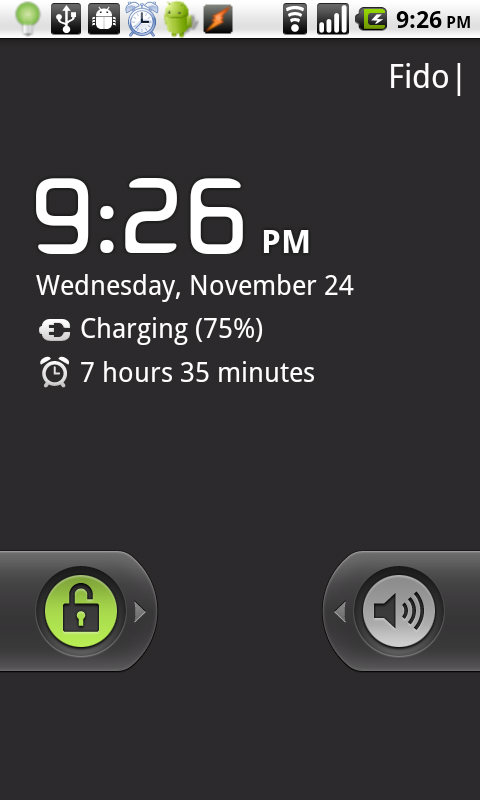 You’ll also see the alarm countdown on the Android lock screen – great for a quick check. As last night’s lock screen shows on the right, I stayed up a little bit late. But wait, there’s more. 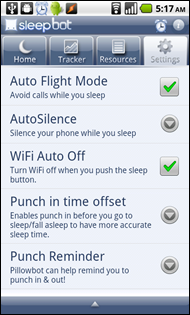 Sleep Bot makes it easy to set all sorts of useful settings to help you stay asleep. 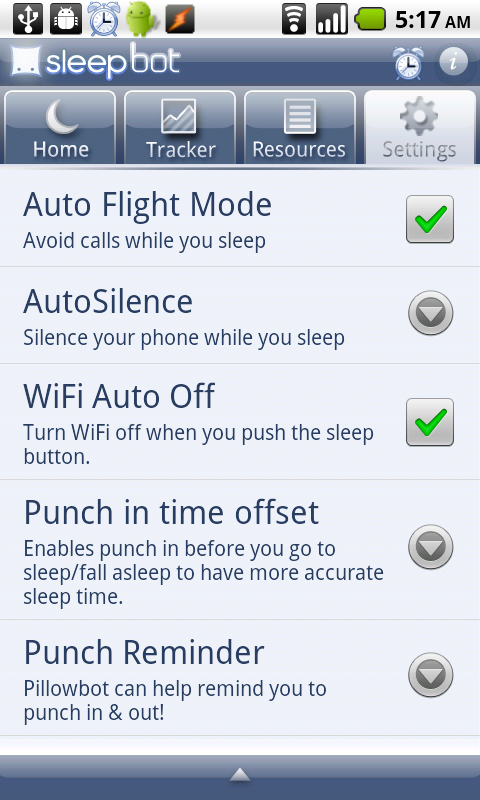 I’ve told it to avoid calls, set my phone to silent + vibrate, and turn off WiFi to minimize late-night disturbances. 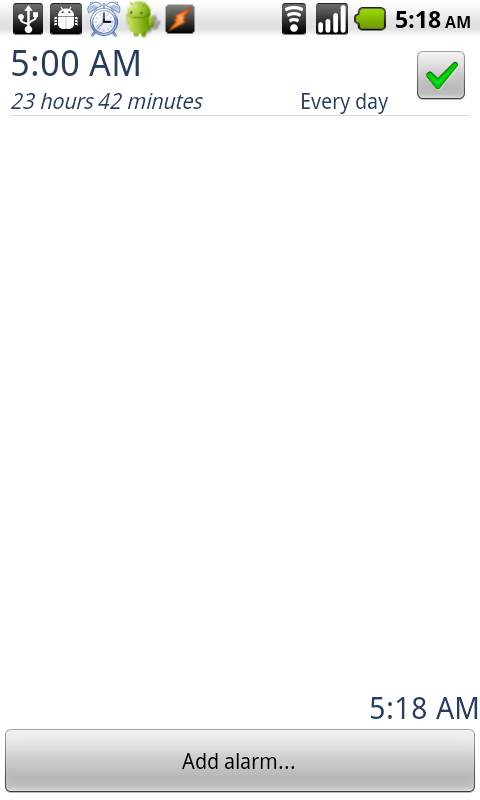 Configuring it is also simpler than configuring similar rules using Tracker, Locale, or other context-sensitive Android applications. Look up the free Sleep Bot Tracker Log application on your Android phone with this handy QR code. 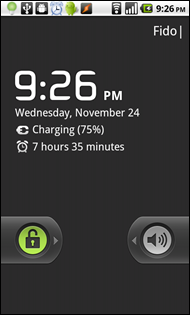 You can add the widget to your home screen for even faster checking in. Recommend.